Kim, the first thing you can do is check to see how the pump is actually anchored to the RV. Is it securely mounted on a non-vibrating surface? Most are installed flat on the floor or the bottom of a wet bay. Also, be sure the rubber isolators are in good shape. Yours probably are since you state it’s a brand new coach. Next make sure none of the fresh water tubing is hitting against any surface, floor, wall, partition, etc. You may need a flashlight to view the tubing as it leaves the output port of the pump. Some manufacturers may be lacking in their securing of the tubing as it is routed throughout the coach. If the original installation appears solid, there are two aftermarket products that may help. One is a “Silencing Kit” produced by SHURflo. It is applicable to any water pump, by the way. 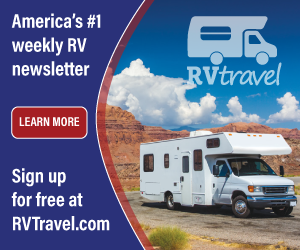 Any RV parts department can order this kit for you; part #94-591-01. I’m assuming your fresh water piping system consists of PEX tubing. 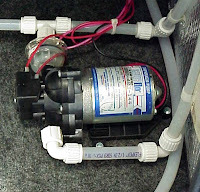 For an optimum installation, it’s best to have a double loop of flexible water hose connected directly to the pump before it is connected to the semi-rigid PEX tubing (unlike the photo above). Not all manufacturers do this, unfortunately. But adding the SHURflo “Silencing Kit” performs the same function. If that doesn’t work, you may require a SHURflo in-line accumulator. It simply installs in the cold water system, downstream of the pump. The accumulator is charged with a cushion of air and acts like a shock absorber while the pump is operating. All water pumps create a vibration when operating, so controlling the amplified effects of that can be minimized with either product.